This shirt really looks fantastic in person. My camera didn't quite capture the fabulocity. 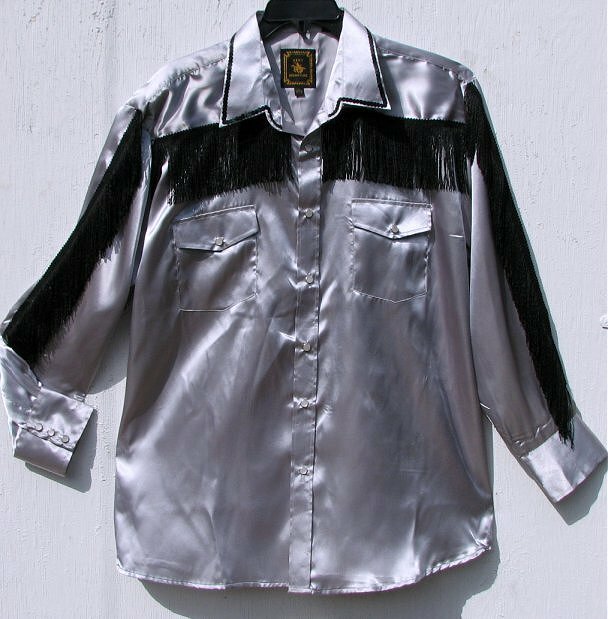 The shirt is made out of lightweight very shiny flashy satin that is paler than the photo. It's not as blue looking. The collar has been trimmed in real black sequins, not sequin dots. Black 4" fringe runs across the chest and down the arms. Boogie Nights wore flashy 70s western clothing. The snaps are a pearlized white. The shirt has a full cut that would be good for stout or stocky men. The sleeve length is only 31-32 inches. Dry clean after wearing. Use a medium warm iron or steam out wrinkles. Not responsible for Customs detaining delivery of item. Due to low claim value, usually no delay.